Brussels: Veggie burgers are for the chop, a Brussels committee has decreed, to be replaced by the less palatable-sounding “veggie discs”. And it won’t be just bean or mushroom burgers condemned to the food bin of history. Vegan sausages, tofu steaks and soya escalopes could all be approaching their ultimate best-before date, after a vote in the European parliament on revisions to a food-labelling regulation. The protected designations would include steak, sausage, escalope, burger and hamburger, under a revised regulation that passed with 80 per cent approval. The measures will now be voted on by the full parliament after May’s European elections, before being put to member states and the European commission. The French socialist MEP Eric Andrieu, responsible for overseeing the legislation, said the prohibition was just “common sense” and he appealed to Europeans’ sense of foodie history. The decision to protect meat-related terms and names “exclusively for edible parts of the animals” was firmly opposed by NGOs such as Greenpeace and Birdlife who insisted it presented a blow against sustainable food. Veggie disc has emerged as one possible, yet possibly unpalatable, new name for plant-based burgers. Andrieu said MEPs had voted purely in the best interests of the consumer and it should be seen as an opportunity for vegetarian brands to make their mark. Molly Scott Cato a Green MEP who sits on the agriculture committee, said she had taken some comfort from the development, although she had some doubts about the motivation behind the new labelling rules. “The suspicion is that this has come from the meat industry out of panic at the fact that young people are moving away from eating meat,” she said. “It is a clear indication that they are worried about their market being undercut - and that’s quite a good sign. There certainly didn’t seem to be a lot of consumer demand for it. The MEP for South West of England and Gibraltar said she hoped the name prohibition could lead to food producers giving up on trying to emulate the meat-eating world. It could take a number of years before the regulation comes into force, but Andrieu called on the EU’s institutions to “get on with it”. In 2017 the European court of justice ruled that plant-based products such as soya and tofu should not be sold as milk or butter. It said dairy terms could only be used while marketing designated animal products, after complaints from German competition regulators about the German firm Tofutown’s tofu butter, veggie cheese and rice spray cream products. “Purely plant-based products cannot, in principle, be marketed with designations such as milk, cream, butter, cheese or yoghurt,” the court said. Cocoa butter, coconut milk and salad cream were exempted under EU law but that “is not the case for soya or tofu”. Concerns have been raised in the past about the health implications of babies being fed soya milk. The Food Standards Agency advises that while breast and cows’ milk are the best sources of nutrition, parents should continue to give their children the soya product if advised to do so by their doctor. The EU is following the lead of France, where MPs last year passed an amendment to an agriculture bill prohibiting any product that is largely based on non-animal ingredients from being labelled like a traditional animal product. Brussels has regularly been accused - particularly in parts of the British media - of unduly meddling in food regulations, with the best known example, albeit wholly inaccurate, being the prohibition on bendy bananas. Should the Commons finally ratify Theresa May’s Brexit withdrawal agreement, the British government would probably have to put the regulation into force if there is an extended transition period. Even if the UK is outside the EU by the time the labelling rule is applied, it is likely Britain would follow Brussels’ lead. 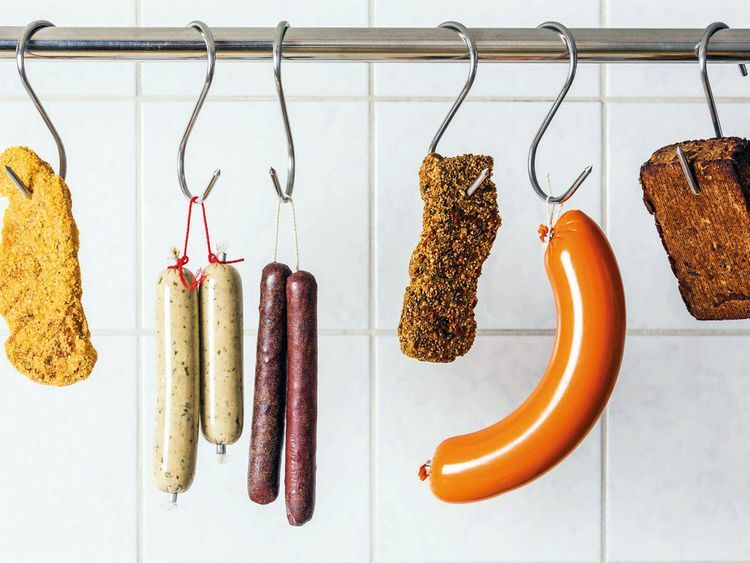 Under article 17 of regulation (EU) no 1169/2011, names currently used for meat products and meat preparations will be reserved exclusively for products containing meat, MEPs have decided. Veggie burgers, quorn sausages, soya escalopes and seitan steaks. Veggie discs, quorn tubes, soya slices and seitan slabs. * Seitan is a popular vegan substitute for meat. It is made from wheat gluten and water and is often promoted as a high-protein, low-carb alternative to animal protein. Food at an elementary school was going to waste. Now, it goes home with needy children. Most kids look forward to the weekend. But for some students at Woodland Elementary School in Elkhart, Indiana, it’s not always a happy time. In a county where nearly 13 percent of children ages 5 to 17 in families live in poverty, according to census data, Bickel said many students rely on free or reduced-price school lunches. But outside of school, their nutritional options could be limited. A new pilot program being spearheaded by an Indiana nonprofit seeks to fill that gap. A food rescue organization called Cultivate has stepped in to re-purpose leftover cafeteria food into frozen meals that needy students can take home over the weekend. Bickel worked with Cultivate and social workers at Woodland Elementary to identify 20 students for a pilot program that launched on March 29 and has so far garnered enthusiasm among the students, Bickel said. The students receive backpacks that double as coolers, and are given eight frozen meals to enjoy over the weekend. Cultivate takes leftovers to its facilities, where a small staff and group of volunteers compile them into meals that include a protein, a vegetable, and a starch. They’re packaged in recyclable containers and frozen to maintain freshness, then placed in backpacks that are distributed by school officials to students in the program. Cultivate Culinary School and Catering was founded in 2016 by Jim Conklin and a local chef, Randy Ziolkowski, after a previous restaurant enterprise fell through. Dismayed by the amount of food going to waste and wanting to help their community, they founded the nonprofit to take food that would otherwise be thrown out by caterers and event spaces and repurpose it into healthy meals for those in need. Cultivate had already begun piloting a school-lunch program similar to Woodland’s at the nearby Madison STEAM Academy in South Bend, Indiana, co-founder Jim Conklin told The Post. The group provides weekend meals for 100 students at that school, and the food comes from donors such as the University of Notre Dame, a partner, as well as local event spaces and catering services. Bickel was part of a local leadership academy run by the Elkhart Chamber of Commerce. Last October, the program’s director of business development, Melissa Ramey, brought in nonprofits for the academy participants to work with, and one of them was Cultivate. Excited by the idea of working with them, Bickel put Cultivate in touch with officials at Woodland Elementary. After deciding the best course of action was the backpack lunch program, they worked with the health department and food workers at the school to implement the best approach. Ramey was proud of the program that had resulted from the leadership academy’s collaboration. and hoped that providing regular meals would help children focus on their academics.